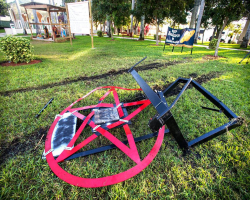 If There Is A War On Christmas, Why Are The Atheist Displays The Ones Being Vandalized? Every Holiday season is the same thing. We are told by conservatives that there is a ‘war on Christmas’ where saying ‘Merry Christmas’ isn’t allowed and public schools aren’t allowed to sing religious Christmas songs and how this will destroy our world… yadda yadda. The ‘war’ is poppycock but why is it that atheist or freethought holiday displays seem to be the only ones vandalized during the season? If there is a ‘war’, it is on inclusion not Christmas. This entry was posted in Entanglement, Groups, Religious Intolerance and tagged civil rights, freedom of religion, inclusiveness, Nativity scene, public square, war on Christmas on December 22, 2016 by Doug. 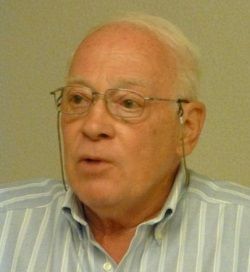 On June 17th 1963, the US Supreme Court handed down its landmark decision that supported the separation of church and state in public schools – Abington School District v. Schempp. Even 50 years after the decision, we seem to have to fight the same battle over and over again. That is what happens in the struggle for civil rights. You have to be vigilant or they can be taken away. We need to celebrate dissenters like Schempp and we all need to try and emulate his activism. This entry was posted in Courts, Entanglement, History, Positive and tagged 1st amendment, Abington School District v. Schempp, Bible reading, church and state, civil rights, Dr. Ellery Schempp, freedom of religion, landmark decision, public schools, religious liberty, US Supreme Court on June 17, 2013 by Doug. 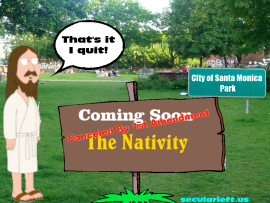 December isn’t the Christmas season – it’s the ‘War on Christmas’ season. It’s the time when the religious right and their propaganda machine called FOX “news” whine and complain if they aren’t allowed to shove their religion down your throat through the use of a diorama of the fictional birth of the savior of said religion based in a public spot like a park or a court house. Listening to the religious right one would assume God would quit if he didn’t see said dioramas in said park. Yeah, right? 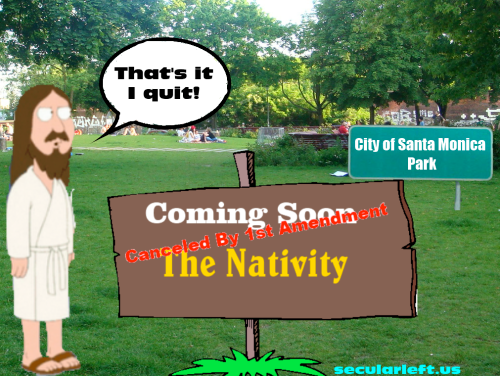 This entry was posted in Courts, Entanglement, Groups, History, Politics, Religious Intolerance and tagged 1st amendment, Christmas, christmas display, church and state, free speech, freedom of conscience, freedom of religion, Nativity scene, religious privilege, Santa Monica, war on Christmas on December 5, 2012 by Doug. This entry was posted in Events, Groups, History, Politics, Religious Intolerance and tagged blasphemy, bullying, censorship, Center of Inquiry. 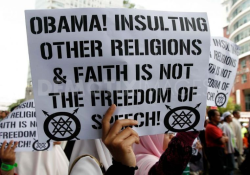 American Humanist Association, civil rights, dissent, freedom of expression, freedom of religion, freedom of speech, Freethought, International Blasphemy Rights Day, religious bigotry, religious discrimination, religious dissent, self-censorship on September 30, 2012 by Doug. I gave an e-mail interview to the website Progress Planet that was posted last night. 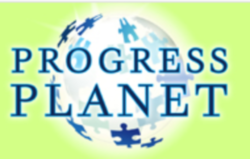 Progress Planet takes a more liberal stance on religious issues and is a site Secular Left could work with on church and state issues. Check out the interview and their website. This entry was posted in Positive, xSite_News and tagged church and state, Eliza Wood, freedom of religion, interview, liberal religion, Progress Planet on August 29, 2012 by Doug.